I'll kick off with mine, an icedclearlooks theme (in the repo's), rox-filer used for setting the wallpaper and gnome-themed icons. The theme was oringally found at box-look, but I modified it a bit. 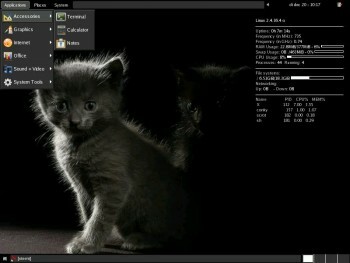 Delicate with E16 as windowmanager. Extra's: different GTK theme, changed rox icons theme, xonclock and wbar. IceWM with bar on top, IceWM theme is a bit hacked Mintee (from box-look), GTK theme called Absolute (from Gnome-look). Wbar 1.3 installed. Wallpaper (pear) found with Google Images. Really nice ... we could introduce some of Your themes as official in some of the future releases ... hopefully without copyright issues. (12-19-2011 11:29 PM)tavvva Wrote: ... hopefully without copyright issues. That's what I'm worried about, a lot of stuff is found on the internet and I honestly don't know what they're thinking... :] I know that when it's for personal use it shouldn't be an issue (most wallpapers are from free wallpapers sites). The GTK-schemes are mostly found and not copyrighted (GPL I believe, and some of them are represented in Arch too). 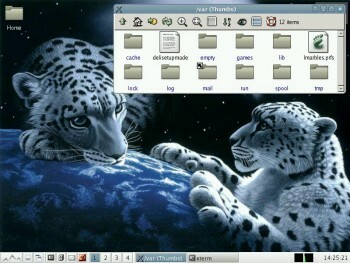 Themes for IceWM are sometimes a mix from various themes (All of them were GPL). Icons well that is another story, I just found them with google and only use it if they fit with eachother. So I don't know which of them are copyrighted or not, but that's no problem there are plenty of icons without copyrights. I used several original Gnome icons, and if I'm finished I can post the system.jwmrc and the rest what's needed. **EDIT: the standard Gnome icons are replaced by Humanity-dark types (found on gnome-look, I believe they have the highest rating, so easy to search. And now it's looking like this.